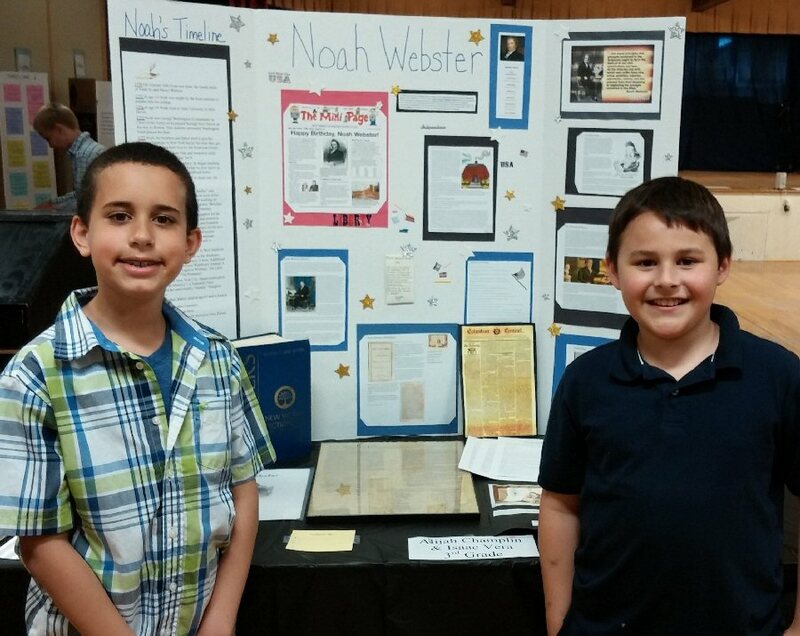 OSWEGO, NY – Oswego Community Christian School recently held a History Fair. Two age groups were judged, third-fourth grade and fifth-eighth grade. Students in fifth through eighth grade made a thesis statement and did research using primary and secondary sources to prove their thesis statement and also the impact of their topic on society. 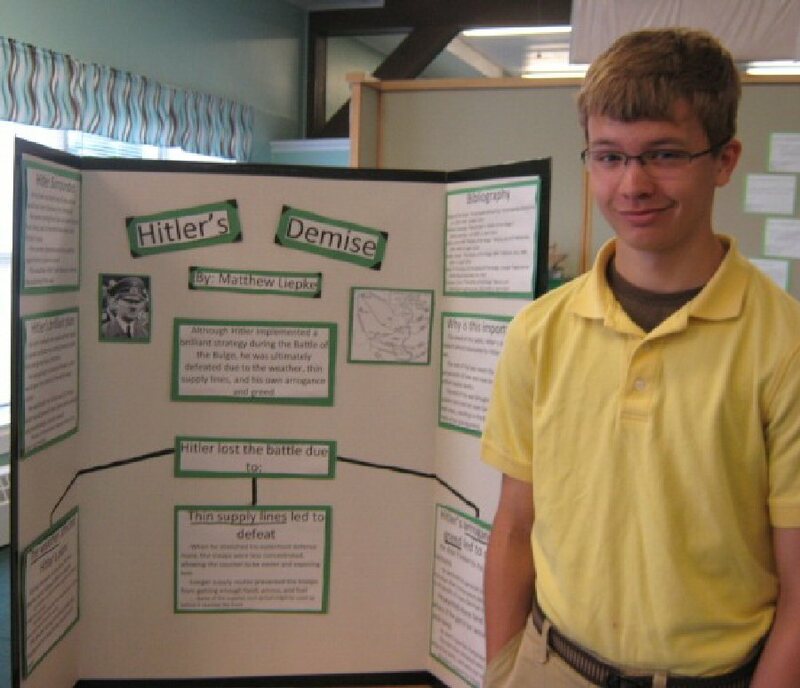 Topics for the group included Hitler’s Demise – Battle of the Bulge, 911’s impact on US Security, Pioneers of Aviation, Goal of Life – Mia Hamm, Elie Wiesel, and Legos’ use in autism to name a few. Third and Fourth grade topics focussed on significant people in American history such as Clara Barton, Robert E. Lee, Noah Webster, Daniel Boone and Ulyssess S. Grant. Judges from various occupations in our community judged each project on historical accuracy, historical relevance and impact, originality, creativity, organization and oral presentation. Many comments were made about the thoroughness, expression and outstanding quality of the students’ work. Jennifer Emmons and Paul Lear, from Fort Ontario, attended the History Fair dressed in 1800s garb. Oswego resident and friend of OCCS, Marilyn Dirk also came in early 1900s dress. Hardtack, a dry biscuit eaten by Civil War soldiers, was served to all who dared to taste it. First place winner in fifth – eighth grade was eighth grader, Matthew Liepke. 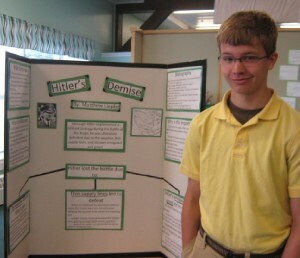 His topic, Hitler’s Demise: Battle of the Bulge. First place winners in third – fourth grade were third graders, Alijah Champlin and Isaac Vera. 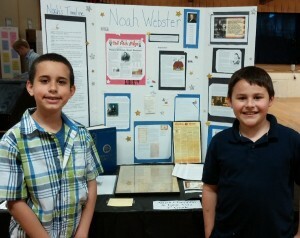 Their topic, Noah Webster. Each first through third place winner received a medal and a gift certificate donated by several area businesses. Oswego Community Christian is still accepting applications for the 2014-15 school year.